So what were YOU doing for fun in middle school? Maybe you were spending every waking moment outdoors, playing whatever activity you could find, regardless of season. Or, if you are of a more recent vintage, you spent your days inside, playing video games on the console du jour. Or firmly entrenched knee deep in one of many other hobbies geared to keep you out of trouble (or at least, not further IN it). But what about starting a business? But it’s that second or third blush that gets you to rethink things. How many times have you driven by a couple of kids manning (“kid-ding”?) a makeshift lemonade stand, assessed a friend or relative for his or her qualifications to babysit your children for a night, or witnessed an intrepid young worker shoveling a neighbor’s walk, raking leaves, or mowing a lawn for a few extra bucks? Even at a relatively young age, the entrepreneurial spirit (or, at least, the desire to make some pocket change) is there. But how can this desire be harnessed in a way that shapes these young minds to emerge as the future business leaders of tomorrow. No….literally…..ENTER one of the 10 Propel School locations around Western Pennsylvania, and you’ll see a tight-knit marriage of students who are driven to succeed and a dedicated faculty and staff who are determined to help the students achieve their dreams. One of the highlights of the Propel academic year, and one to which we pay particular attention here at “The Raja Show”, is the annual Student Business Plan Competition. With the guidance of faculty advisers and mentors, dozens of Propel students form self-directed work teams to devise business plans in hopes of winning capital to actually START their enterprise. 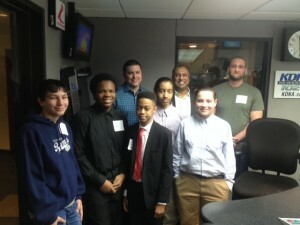 The 2016 presentation of these awards took place on April 7, and on this edition of “The Raja Show”, Raja welcomes these winning students into the studio. We will feature the “Logical Landscapers”, a landscaping service comprised of five students from Propel McKeesport, 8th Graders Dominic Brown, Dorian Garcia, and Anthony Thompson, and 7th Graders Jonathan Lust and Terrick Wright. In addition to the great students, we’ll have some “grown-ups”, too, in the form of entrepreneur Josh Cotherman of The Cotherman Group, who has worked tirelessly in support of the mission of Propel Schools, as the driving force behind the creation of this annual contest, in order to foster the next generation of Western Pennsylvania entrepreneurs. Plus, we’ll feature Brendan Surma, a rising star in the Western Pennsylvania business scene who also serves on the board of Propel Schools. If you have ever thought “Well, I could NEVER start a business!”, then hearing the stories of these enterprising young students on Sunday just may change your tune. These are some truly remarkable students whose stories MUST be told, and we have the honor of doing so on this show.